TYBEE ISLAND Georgia — What is this love affair with the open sea shore? Is it a wide-open opportunity to feed the soul? Do the robust waves remind us to laugh, to move, to explore, to roar, to be steady, resolved and calm once more? Sand and sea. Rich history. Fresh local seafood. Wide-open, ocean beach. Are these all here just for me? For 365 days per year, recurring themes on the seashore are stolen moments, sun holidays, ocean breezes, happy times, wide open star-gazing, peaceful strolls, nature consoling, and simple memories. Between the old “cotton king” town of Savannah and the Atlantic Ocean is Tybee Island. The open ocean beach offers three-plus miles of flat, grey speckled beaches, sand dunes for near extinct turtles and shore bird nests, remnants of a thick-walled fort, and a towering historic lighthouse still pointing the mariners along a safe course. The beauty of the sea shore beach is classic. At Tybee Island the little island village on the wide open beach is an informal, welcoming place to be. The world’s birds migrate, gathering to feed and rest on Tybee Island’s north beach. Year around gulls fly into the open beach, seemingly the official hosts to welcome our arrival. An ocean breeze hurries grey clouds out to sea. “Did the storm clouds move just for me?” the city-slicker beachcomber might muse. Tybee Island beach sand is where the grey quartz and granite sediments of the Appalachian Mountains tint the beach sands. “The black streaks are pulverized granite, washed down from the mountains,” reports Sherpa Guides. We think the answer could be, “Yes, the beauty of the Earth is here for you.” And, we are grateful. this our joyful hymn of praise…. – “For the Beauty of the Earth”, Folliott Sandford Pierpoint (1835 – 1917), hymnist and poet. The words “just for me” don’t appear in the quote below. Could it be those thoughts are simply unspoken? 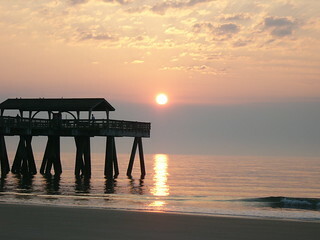 We really like the thought that the bountiful beauties at Tybee Island are “just for me” … and you. Come visit. Check out the sea shore experience at Tybee Island, Georgia and Lighthouse Inn. This entry was posted in Lighthouse Inn News, Story Ideas and tagged beach, beach inn, bed and breakfast, georgia beach, georgia beach inn, tybee, tybee bed and breakfast, tybee cottage, tybee inn, tybee island, tybee island georgia, tybee lodging. Bookmark the permalink.